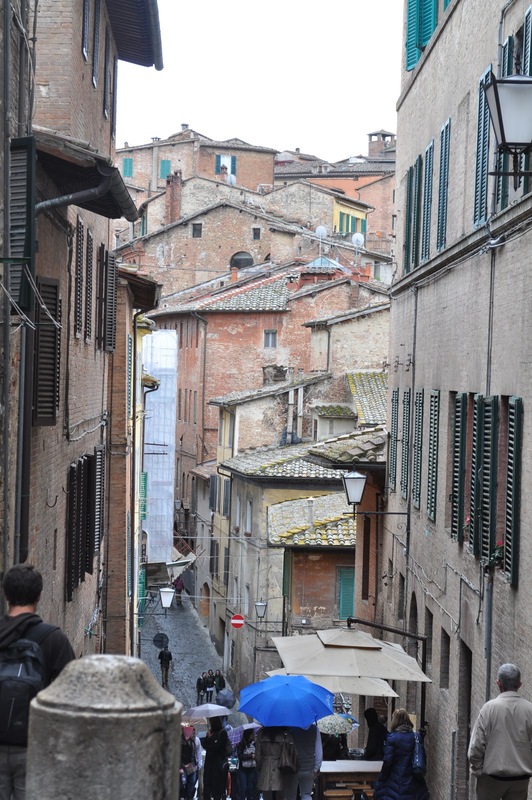 On our second day in Florence we went for a day trip to Siena. The bus trip took about an hour and 20 minutes costing €14 round trip. This was wayyyy better than opting for a group tour as we could do it at our own pace for about a quarter the cost. Upon arrival, we wandered around looking for a tourist hub for some kind of map. After a while, we gave up and realized that Siena is tiny, easy to navigate, and almost impossible to lose yourself in. We started off visiting the famous Piazza del Campo where the bi-annual Palio (horse races) takes place. I could easily picture the square being transformed and filled with thousands of people representing the 17 city districts. It's a tradition centuries old and it's a sign that Siena is still filled with culture and neighborhood pride. We then visited the the Duomo (because there is a Duomo everywhere), another elaborate Romanesque cathedral dating back to the 13th century. The interior is absolutely stunning with ornate marble patterns throughout the walls, columns and ceilings. Afterwards we headed up to the top to the Panorama del Facciatone for a remarkable view of the city and surroundings. Time for roaming around and lunch. We found La Bottega dei Sapori Antichi just in time to hide out from the sudden downpour and munch on some paninis, which is just a plain sandwich in Italy. We ordered a classic proscuitto, mozzerella and tomato, and one with three meats which I can't remember. Once again, I can't say enough about these simple sandwiches focused on the quality ingredients, the mozzerella was soft and almost silky and even the tomato tasted like it was just picked. Do they have a tomato farm out back? And maybe a cow? Two huge sandwiches and 2 glasses of vino was €20. There's nothing better to do at this point than to walk around and digest, even if it's in the rain, after all that's when cities are most beautiful. Sichuan liang fen at home!